Salmon have one of the most incredible life cycles in all of nature. They’re born in a river, migrate to the ocean (where they often spend several years), return to the same river they were born in to spawn, before they die. It’s an amazing process that you can actually experience step-by-step at the Issaquah Salmon Hatchery. 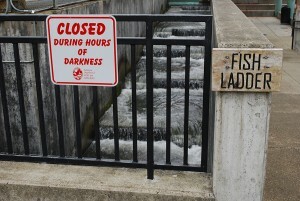 The Washington Department of Fish & Wildlife have operated hatcheries for more than a century. Their original purpose was to produce fish for harvest, but their responsibilities have grown over the years. 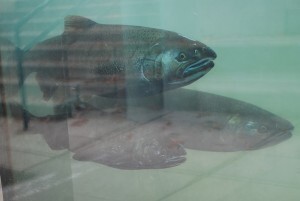 The hatcheries (including the Issaquah Salmon Hatchery) are extremely important to the existence of local salmon, many of which are considered either threatened or endangered species. Open year round, the Issaquah Salmon Hatchery is most active during the fall when the salmon make their grueling upstream return from the ocean. The bulk of the salmon migrate back to our area in mid-September through October. The Issaquah Salmon Hatchery (125 W. Sunset Way) was created to help restore salmon runs in Issaquah Creek. Coal mining, logging and other activities have all but destroyed the natural salmon runs in our area (often blocking streams, etc.). The hatchery not only helps the salmon complete their life cycle, it also aims to “cultivate a sense of wonder about these remarkable fish.” That’s why the hatchery offers free tours to anyone and everyone on Saturdays and Sundays at 11am and 1pm during the fall spawning season (August 31st-November 10th). The Issaquah Salmon Hatchery is a public facility, so you are also free to wander around by yourself. The hatchery is open daily during daylight hours, while the indoor exhibits are only open from 8am-4pm. When you first arrive at the Issaquah Salmon Hatchery you walk across a bridge that takes you over Issaquah Creek. Chances are you’ll see throngs of kids looking over the side, and you should do the same. In the creek below, you’ll see salmon in their natural habitat, slowly making their way to the hatchery. 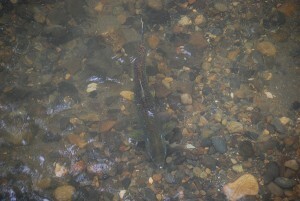 You can even spot male salmon digging their redds (or nests) in the creek for spawning. 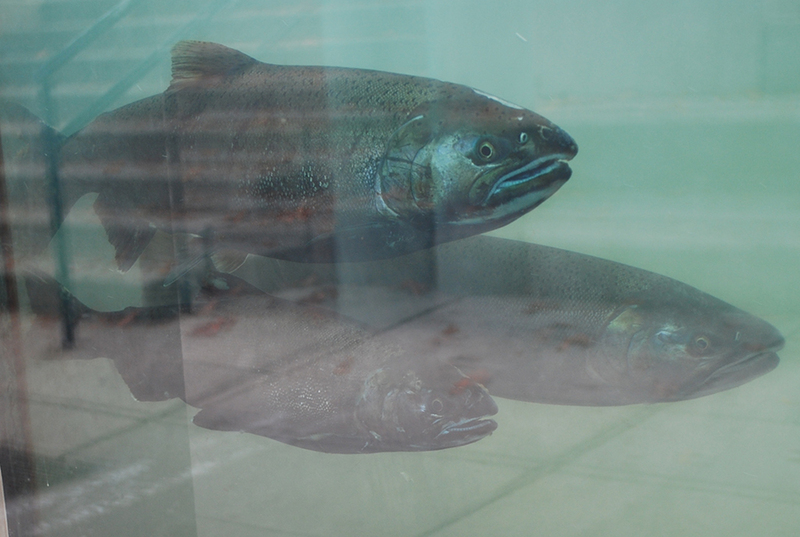 Once you’re on the grounds, you can see how the Issaquah Salmon Hatchery assists in spawning. They trap adult salmon, smack them over the head, cut open their bellies, and collect eggs and milt (or sperm) for fertilization. Just a heads up — this process is not recommended viewing for small children or the faint of heart. It usually happens in front of the public on Tuesday mornings at the hatchery. While it’s not the most pleasant for some to watch, you need to remember these salmon are going to spawn and then die anyway. The Issaquah Salmon Hatchery is just guaranteeing fertilization, helping the future salmon population in our area. You don’t want to miss the fish ladder at the Issaquah Salmon Hatchery. 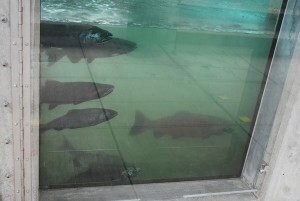 It’s my favorite part, because there are several windows that allow you to get an up close look at the salmon. At this point in their journey, many of the salmon are dark red which is a signal to potential mates that they’re ready to spawn. The males have grown teeth and kypes (or beaks), and their bodies are beat up from the grueling adventure. Many of these salmon have traveled hundreds of miles (through rough rapids, over waterfalls, etc.) to get here. From Asotin County to Clallam County, there are fish hatcheries all over the state. None are more popular than the Issaquah Salmon Hatchery, which draws thousands of visitors every single year. It not only allows you to get up close and personal with area salmon, but it’s also very educational. There are informational signs, interactive programs, and helpful volunteers that make the Issaquah Salmon Hatchery an awesome spot to learn about one of the animals that makes Washington unique. Have you ever visited the Issaquah Salmon Hatchery? What was the most interesting fact you learned? We’d love to hear from you! Please leave a comment below or connect with us on Twitter, Facebook, and Google+. Don’t forget to also check out Seattle Bloggers for more cool places to check out around the Puget Sound.